How do you like your coffee? It’s not a simple question of black or light any more—especially in high summer, when seasonal specialty cafés crowd in to join year-round Martha’s Vineyard coffee shops like Mocha Mott’s and Espresso Love. This time of year, along with the usual menu of drip and espresso drinks, you can order coffee extra-hot from a siphon or cold-brewed in a flask; flavored with lavender syrup or fresh mint; even infused with nitrogen and dispensed from a tap, foaming like ale. Folks in a hurry for their caffeine fix can still grab a quick cup of drip at any Island coffee shop; for Starbucks aficionados, Edgartown Meat & Fish serves the superbrand year-round. But at the seasonal cafés, such as Behind the Bookstore and Toccopuro, many coffee connoisseurs opt to wait for their “pour-over,” brewed one cup at a time by a true-believer barista who can tell you where the beans were grown and exactly who roasted them. Mikhail Sebastian (aka Misha) is director of the coffee program at Behind the Bookstore. During the off-season, he visits roasters and growers in search of the best beans. — Jeanna Shepard. 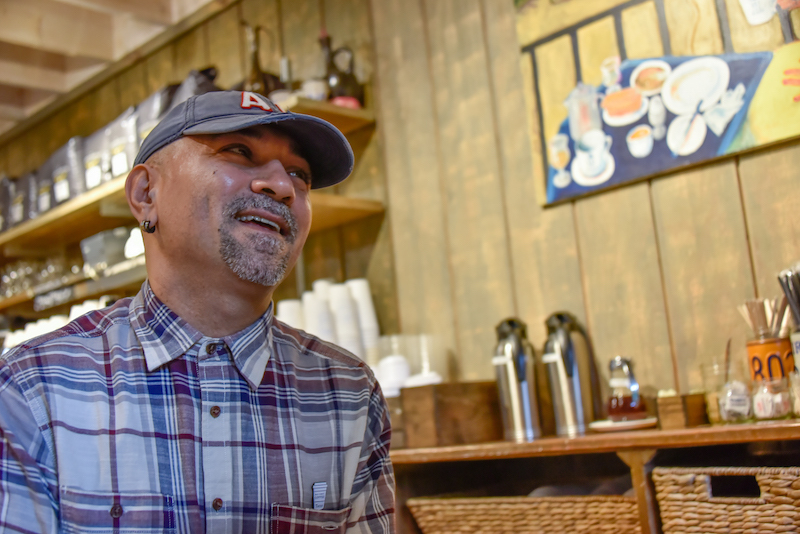 “People who really care and understand—they get the better coffee,” says Mikhail Sebastian, director of coffee for Behind the Bookstore in Edgartown and its satellite shop, BTB, in Vineyard Haven. Misha, as he’s known, has spent the past eight years immersed in coffee culture and education. He’s worked with a roasting company in Chicago and on a Hawaiian coffee plantation, and spends his off-seasons traveling to the coffee lands of Africa and Latin America to meet the farmers who grow the coffee cherries. In 2015, Misha was hired to create the coffee program at Behind the Bookstore, which now offers drip, pour-over, espresso and cold brew coffees (see primer atDIR) sourced from specialty roasters in the U.S. and overseas. The Chicago-based Intelligentsia roasting company and 49th Parallel, from Vancouver, British Columbia, are mainstays at Behind the Bookstore and every year, Misha also curates a rotating “guest roaster” collection highlighting smaller European companies. “People in Europe roast differently,” says Misha. “They try to bring more flavor out of the coffee.” Behind the Bookstore is currently featuring Nordbeans from the Czech Republic and Manhattan Coffee Roasters from Rotterdam in the Netherlands. This is the first time either company’s coffee has been available anywhere in the United States, Misha says. What you won’t find at Behind the Bookstore is the kind of dark-roasted coffee popularized by Starbucks. Dark roasts are great for concealing defects in coffee beans, and terrible at bringing out natural flavors, Misha says; they taste “like a burned boot, or like a tire that burst into flames.” Dark roasting also burns out the natural sugars in the coffee bean, leaving a bitter taste. “It has to be roasted between light and medium, never dark,” he says. At the West Tisbury Farmers’ Market, you can get your cup of coffee directly from the man who roasted it: Todd Christy of Chilmark Coffee Company, based at his family’s up-Island home. 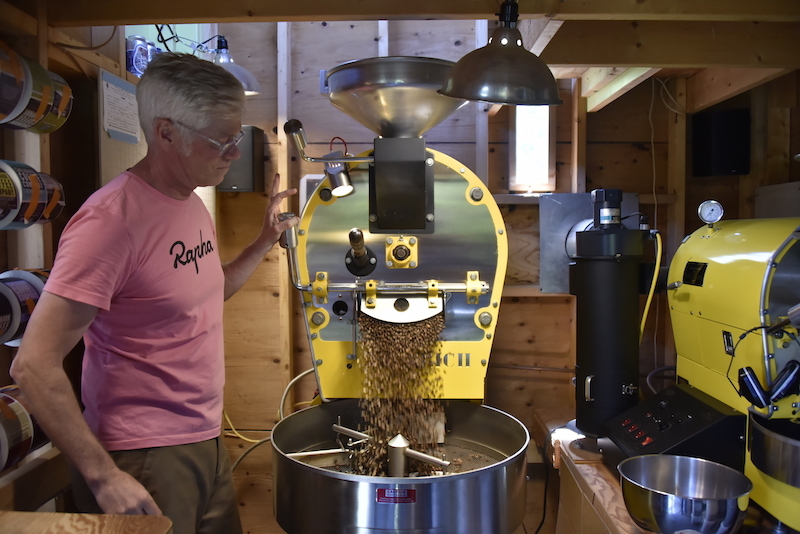 Last year, Todd says, he processed about 26,000 pounds of organic beans a year in his backyard roasting room—most of it in the four months of the summer season. 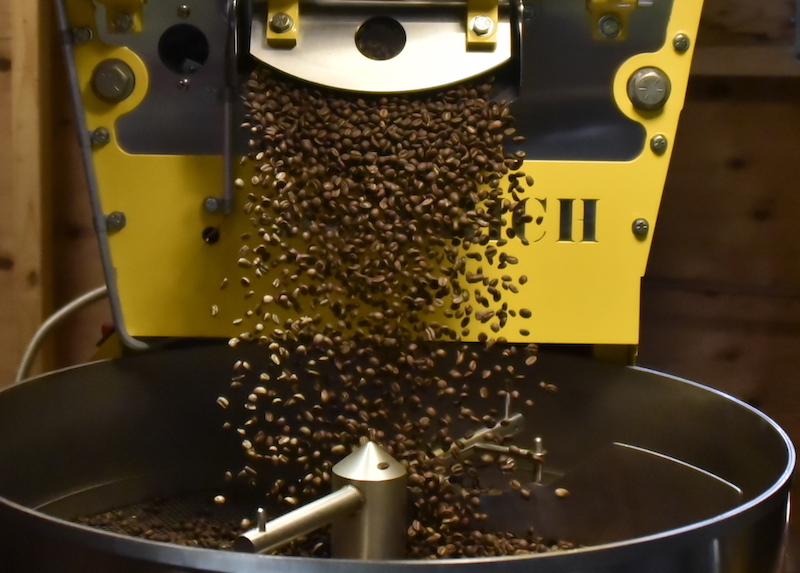 “It is definitely a challenge to keep up,” says Todd, whose largest roaster—a duckling-yellow Diedrich, made in Idaho—handles just five pounds of coffee beans at a time. An avid cyclist and triathlete, Todd would rather be on his bike or with his family than traveling the world, so he sources his beans from distributors who work directly with farmers. “I really like coffee, but I’m not a crazy coffee person,” he says. To preserve and bring out the brighter flavors in the beans, Todd seldom roasts them past medium. With the help of an assistant, he then bags and labels them for sale at retailers around the Island. Numerous Vineyard restaurants, both seasonal and year-round, serve the Chilmark Coffee brand. Todd also pioneered “nitro" coffee on Martha’s Vineyard, after discovering the nitrogen-infused cold brew on tap in Austin, Texas, a few years ago. Nitrogenated cold-brewed coffee, dispensed from the type of tap used for Guinness Stout, has a creamy appearance, texture and taste even without added dairy. “Because it’s so aerated, it does have a little bit of a sweeter flavor,” Todd says. Chilmark Coffee nitro is available at the Chilmark Store and from Todd’s coffee trailer at the farmers’ market. The M.V. Gourmet Bakery Café in Oak Bluffs has taps for both black and latté nitro from Philadelphia-based La Colomba. A former Edgartown resident, Denis Toomey, is also seeking to enter the nitro marketplace with his Church Street Coffee Co.
“I think we’re going to see nitro in more places,” Todd says. One of them will probably be Behind the Bookstore, in a future summer: “I really want to do it, but we have to figure out the space,” Misha says. 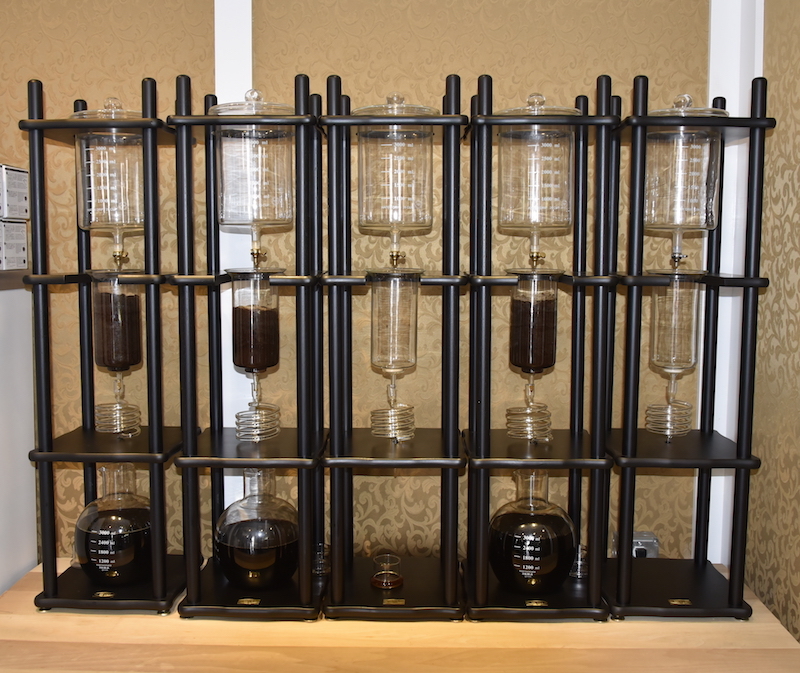 Toccopuro's Japanese cold brew system is on display at their new Oak Bluffs store. — Jeanna Shepard. 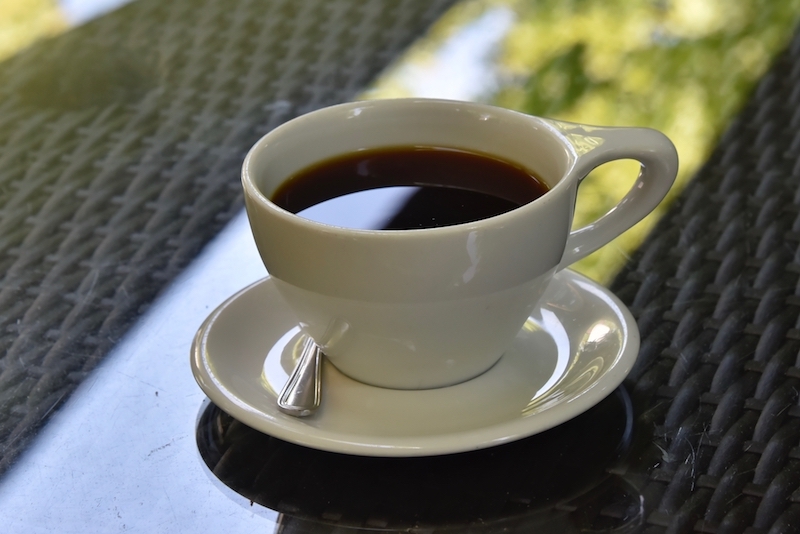 With or without nitrogen, cold-brewed coffee represents one of the biggest sea changes in 21st-century coffee culture. While traditional iced coffee is made by simply pouring brewed coffee over ice, most cold brew is steeped for up to 24 hours to create a rich and flavorful beverage that is lower in acid than coffee made with hot water. 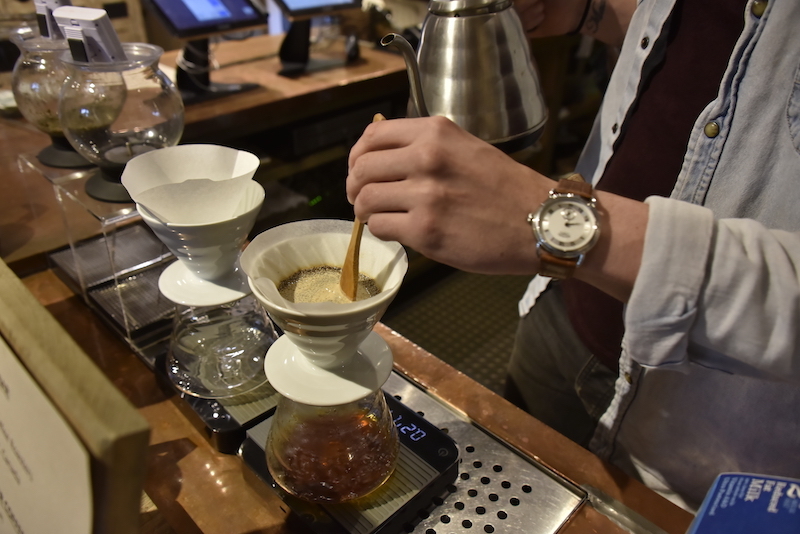 Toccopuro, in Edgartown and Oak Bluffs, showcases a Japanese method of cold-brewing coffee that dispenses water onto the grounds one slow drop at a time, yielding a concentrated elixir. 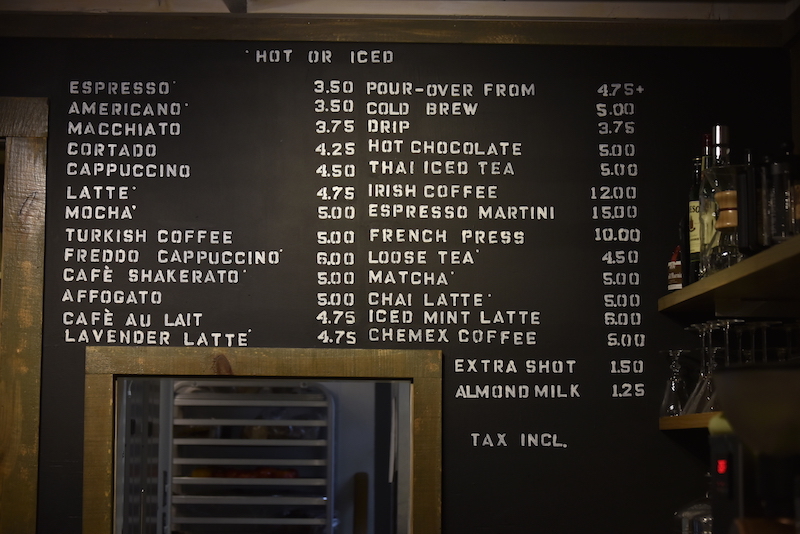 Toccopuro has other unusual offerings as well, including bubble tea with tapioca and siphon coffee prepared with a vacuum brewer that yields a piping hot drink. Misha also frowns on commercial coffee additives, making his own lavender syrup from Island flowers for the shop’s lavender latté and using fresh mint leaves in the iced mint latté. Never mind espresso. When ordering a simple cup of coffee on the Island this summer, you’ll have to make a few decisions. French Press: Coarsely ground coffee brewed in a beaker and then pressed through a sieve.